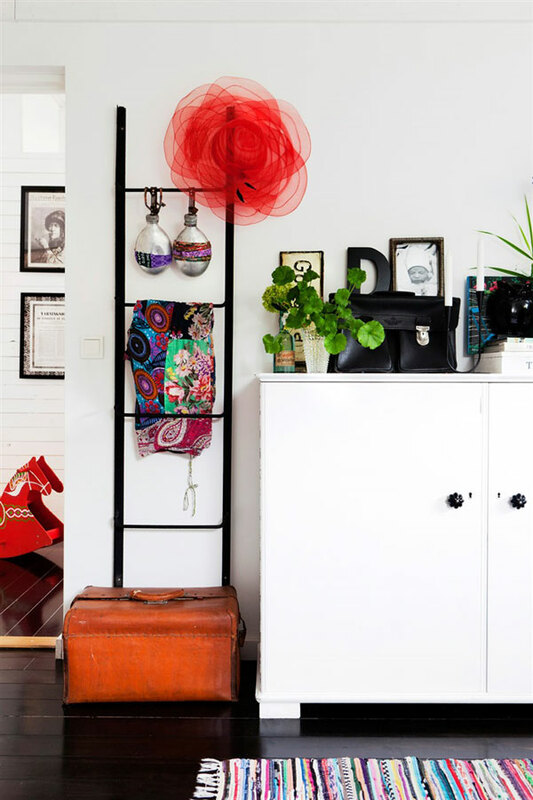 Homeowner: Hannah Billberg Stylist: Anna Mård. Photographer: Karin Foberg - shared with kind permission. / Hus o Hem. Post inspired by inspired by Desire to Inspire with thanks. Wow, I love this home. It's so refreshing! I love the creativity with which it's been put together. How about you? I first visited Sweden when I was around seven years old to visit Ullis and her family (who are still great friends today). Her mother Yvonne, has a loom and she'd make these wonderful rag rugs. 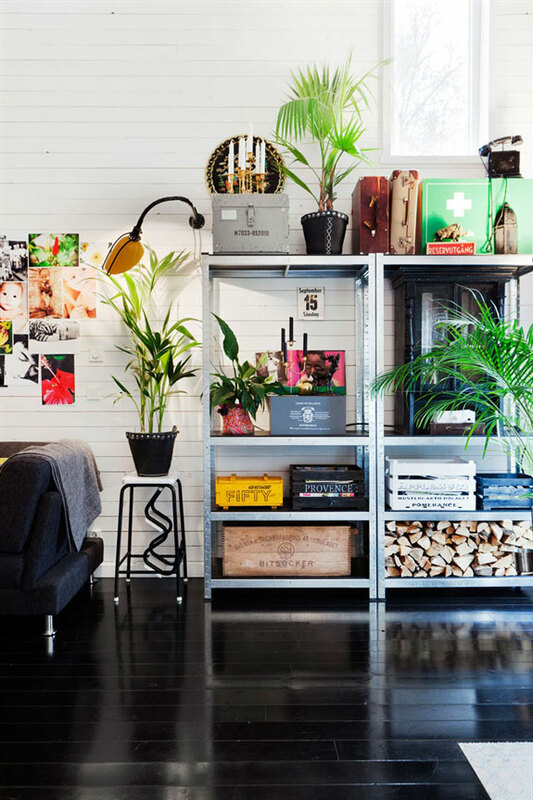 I've been a huge fan of them ever since - they're just so simple and such a great way of brightening up a space. 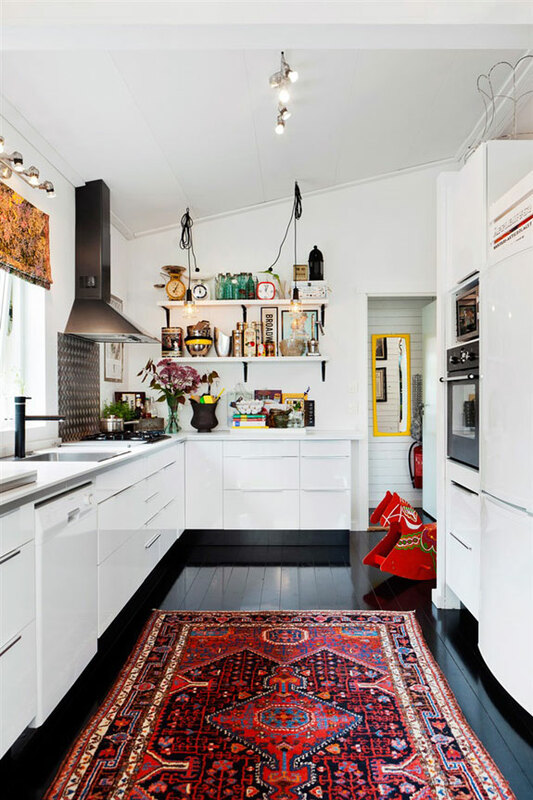 I love how the colourful rag rugs in Hannah's home pop against the black floor too. Try Etsy for similar. - Create moodboards using colourful pictures to brighten up a hallway, or delicious looking recipes cut out from magazines in the kitchen. - Add a touch of comfort to bent wood chairs with fluffy, bright colour seat cushions. 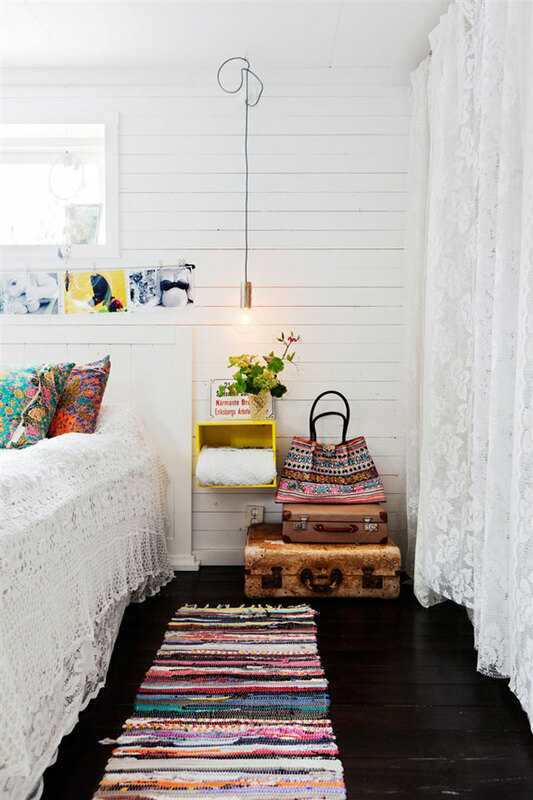 - Adding a splash of paint to a simple box makes a fab wall-mounted bed side table. You can see more of Hannah's charming home on Instagram. 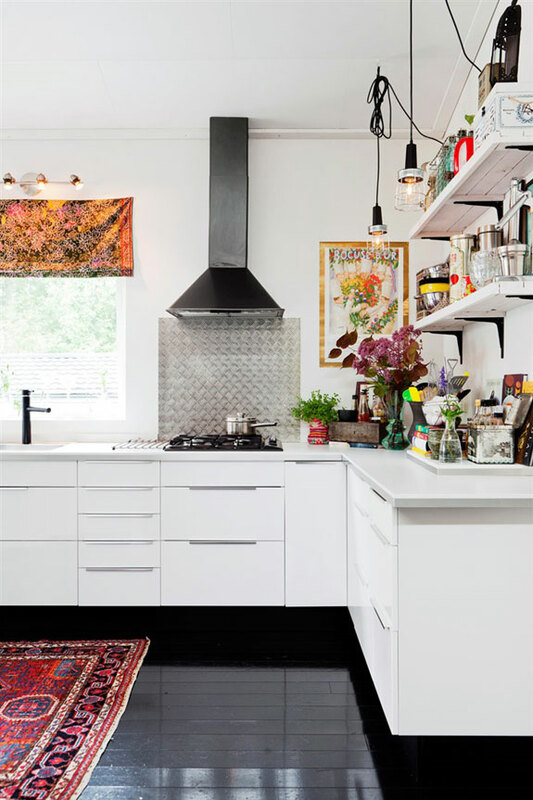 For more inspiration this weekend I'm loving this cheerful Swedish home with bright splashes of colour and another home with black floors but in a whole different style. 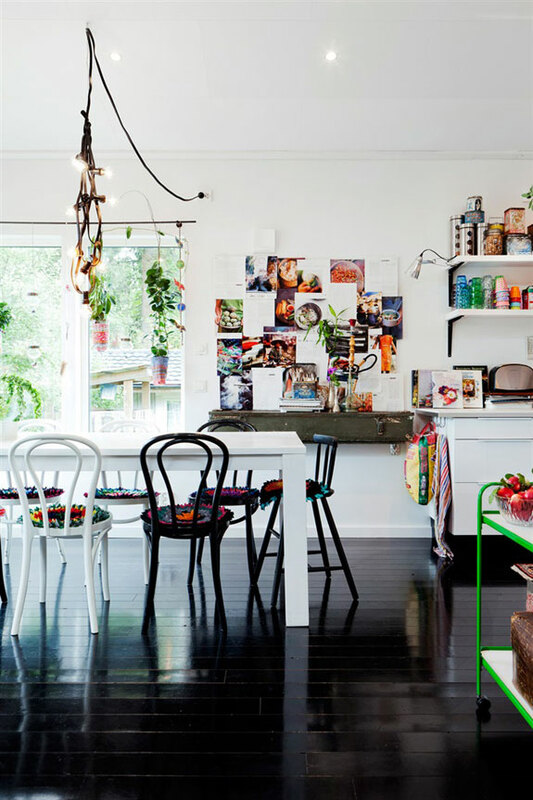 Or perhaps you're inspired by green floors or even red floors?! I like the black floors with the white walls, they are the blank canvas, and frame for the Art of the rest. I have black floors in my house! They are very dramatic and accented by beige area rugs....very peaceful and serene. This is my absolute favorite of all of the lovely homes you've posted! I love the calming neutrals of other homes, but this one is clean and energetic too. Perfect! Once again, thank You for all inspiration that You share! Ooh, do you happen to know where that dalahast is from? 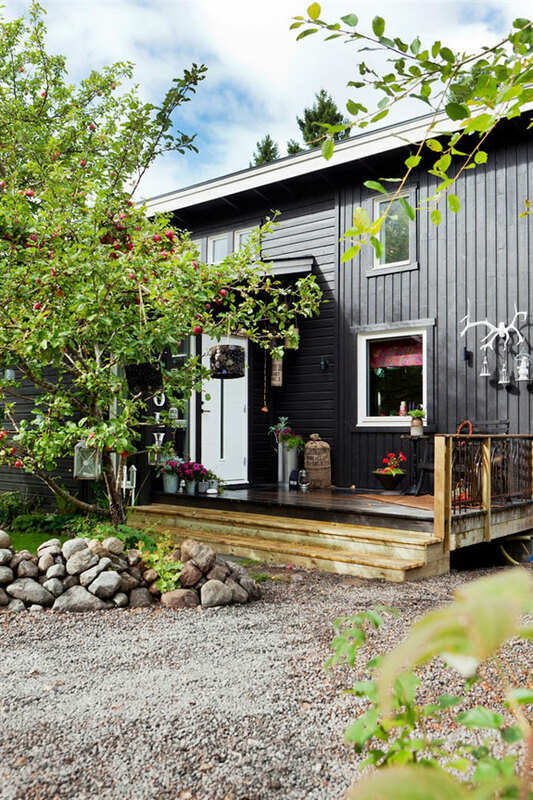 This is a beautiful, lovely home. My question: I tried to buy black floor paint and the shop talked me out of it. They claimed that every spot and speck of dust or dirt shows. I am not a neatnik (by any means) but a perpetually dirty-looking floor might drive me crazy. Was the shop correct?